Newish player (level 61) looking for any advice I can get as the arena seems to be the only aspect of the game that isn't any fun. I generally hang out around 1200 but can't seem to beat anyone higher than that. I've posted my current options below ad well as typical arena opponents. I'm doing 3-4 refreshes a day or so farming gear and geo soldier, qgj and phasma shards, but it doesn't seem to be helping me catch up. Any advice would be greatly appreciated. The problem is your opponents are outclassing you in levels, gear, and stars. It's probably going to take some time to get a squad up to that level. You need to be at least 72 to be able to use most leader maxed ability, don't waste your time trying to get higher before you reach that level. Then, you need 5 seven stars toons with good AI to work on defense and annoying ability (speed down, stun, ability block, etc...). 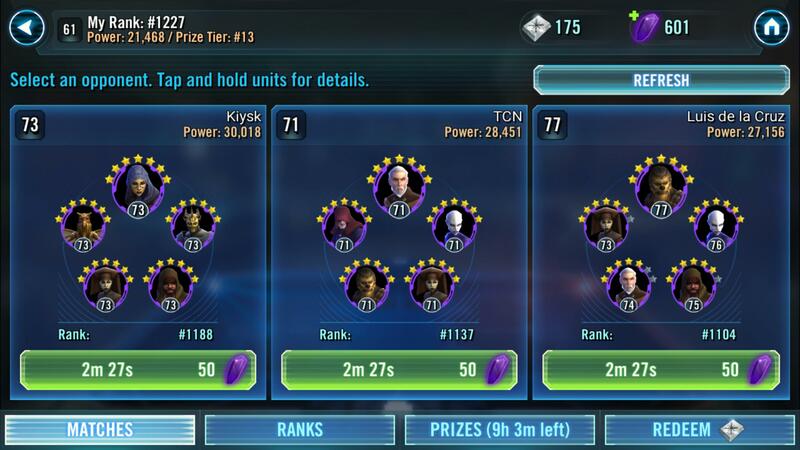 Otherwise, the easier way to ve a strong arena team fast is to run a droid team. Poogle the Lesser (Lead) Poe Dameron, IG 86, IG 88 and Geonosian Soldier. You can ve most of this toons in different shipment (Cantina, Arena, Galactic War). Bro, you have it already. Just keep leveling up. Try to do as many of the Dailies as you can. You'll be there in a few weeks. did you perhaps take a break from the game, but started playing agian? I see you've got a 3 star royal guard down there. I'd focus my shard farming on him as much as possible because he'll be the key to defending any progress you make into the top 1000. I would consider putting him in your team when he hits 5 star if you have him sufficiently geared up. Should be solid to get you into the top 1000 at least. Could I go for Han from arena instead of rg? Was thinking of Leia from there but maybe Han could bridge the rg gap? Wow you are really far behind. Seems to me it will be really hard to get back up in the top in arena. My advice would be to start over. Keep resetting the game until you get Rey with the first chromium pull or at least a viable 4 star character. Should only take you a month to get back to where you are now. At that point your team will be much better with the experience you have. 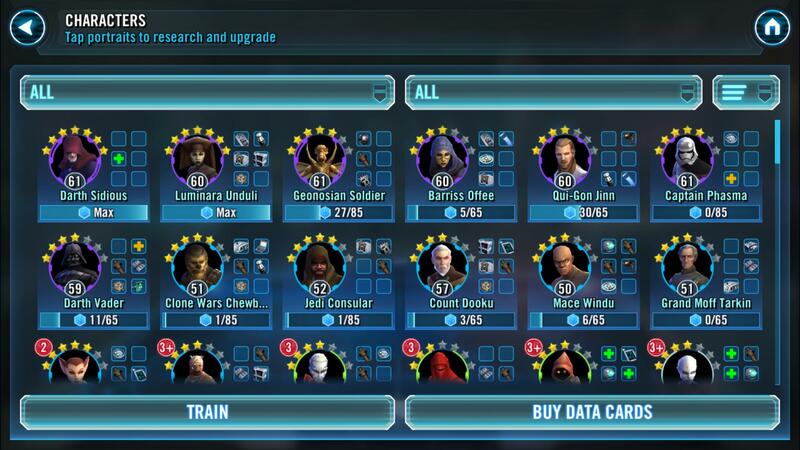 From the start work on ST Han from arena, RG from hard nodes, Rey from hard nodes, Lumi from GW, and GS from Cantina nodes, QGJ from Cantina shop. With that team you should be top 20. Yes han maybe or some Tank and remove Lumi from my line ups I mentioned. You will never catch up if you downloaded it at the start and then came back to it. You and 19999 other people started on that server that day and that is who you are playing against in arena. My advise is start all over and stay focused on the core you need for arena and GW. Spend to get to the top in arena and you can stay there and reap those rewards fairly easily. the opponents you face in arena is based on when you started playing. I'm not completely sure because you say you installed it when it was released, lvl 70 at rank 1000 seems pretty low for that many months of playing, even at rank 1000, but you being kinda far behind probably means that you are facing players that started back when you installed the first time. Them being able to continously play puts you at a mayor disadvantage. I might consider @Jcrandall21 's suggention and start over. you only need 5 good toons to be good in arena. I would not start over I would just make a list of the 5 characters you are going to work on. prioritize gear on these 5 characters and do stars as you go. Once you have your 5 ( and it doesn't truly matter until top 50) your offense can get you up there. If you complete your dailies everyday level 70 will come quickly and the level gap is not as big of a deal as the gear. Get into a good guild so that you can get extra gear.